Background: The staging of human African trypanosomiasis (HAT) has been greeted with different benchmarks ranging from white blood cell counts to the use of immune component profiles across regions. Objective: The aim of this study was to analyze an array of cytokines to identify potential markers that could be used in the staging of HAT in Nigeria. Methods: Sera and cerebrospinal fluid (CSF) of 35 HAT seropositives from Abraka, Delta State, Nigeria were subjected to cytokines (interleukin-10 [IL-10], tumor necrosis factor-α, IL-1α, IL-7, and IL-13) analysis using enzyme-linked immunosorbent assay. Welch t-test and Tukey analysis of variance were used to analyze the data. Results: Comparing mean cytokine levels of weakly, moderately, and strongly positives and between as early and late stages results showed significantly depressed CSF levels of IL-1α and IL-7 while IL-10 was significantly elevated in the strongly positives as well as in the late stage. Conclusion: We strongly suggest that IL-10 could be playing a key role in the immuno-pathology of HAT, thus should be considered a biomarker for the late stage. In addition, data from Uganda and Malawi have shown differences in TNF-α profile of HAT patients with early and late stages of infection. In the middle of these varied suggestions regarding the roles of some cytokines in HAT disease progression, it was imperative we described for our locality. Thus, the roles of IL-10, TNF-α, IL-α, IL-7, and IL-13 among seropositives as well in the early and late stages of HAT are discussed. Volunteers were drawn from three communities (Umeghe, Urhouka and Ugono) of Abraka, a HAT endemic focus. Abraka which is in Delta State, Nigeria lies between latitude 5°47' to 6°15'N and longitude 5°42' to 6E. The predominant occupation of the over 5000 population is farming. Ethical permission was obtained from the Delta State Ministry of Health and Eku Baptist Hospital. Informed consents were sought and granted by participants. Of the 474 screened using card agglutination tests for trypanosomiasis, only 35 were recruited into the study being seropositive as well as measured up to the inclusion criteria. The demographics of the 35 positives are thus: 20 females and 15 males; age group ranged between 7 and 70 years with the following breakdown (7-10 years [n = 5], 11-18 years [n = 14], 19-50 years [n = 13] and 51-70 years [n = 3]). Double serial dilution were used to group seropositives into: Weak (1:2-1:4) (n = 9), moderate (1:8-1:16) (n = 12), and strong (≥1:32). In addition, the 35 seropositives were further screened for parasites in the blood and CSF including determining the counts of white blood cells in the CSF. So, 16 persons were either at the early (n = 12) or late stage (n = 4) of HAT. Following medical examinations, most of the seropositives had symptoms such as malaise, anemia, headache, pyrexia, weight loss, and weakness. We excluded volunteers with malaria particularly those with moderate/heavy parasite load including individuals showing symptoms of malaria. Similarly, individuals with overt diseases such as viral hepatitis B, HIV, sickle cell anemia, and diabetes were identified using standard procedures and excluded. Sera and CSF were obtained from the positives and then analyzed for IL-10, TNF-α, IL-1α, IL-7, and IL-13 using standard enzyme-linked immunosorbent assay according to the manufacture's protocol (Abcam Plc, United Kingdom). Similarly, cytokine analysis was carried out on 20 control subjects who were HAT negative among the population. Data obtained were subjected to the test instruments of Welch t-test and Tukey analysis of variance using InStat Graphpad Statistical Package, Inc., (CA 92037, USA). [Table 1] shows the distribution of cytokine levels in relation to seropositive status. The mean level of IL-10 in the strongly positive was highly elevated (P < 0.0001). Similarly, mean TNF-α for strongly positive was relatively high (P < 0.001). Other cytokines (IL-1α, IL-7, and IL-13) were not significant with the degree of positivity. [Table 2] compares the cytokine levels between early and late stages of HAT. Late stage of HAT for mean IL-10 was significantly elevated in the serum and the CSF. Raised mean levels were only observed in TNF-α in the serum of late stage, but in the CSF, no significant change was seen. Meanwhile, CSF IL-1α and IL-7 were significantly depressed in the late stage (P < 0.05). 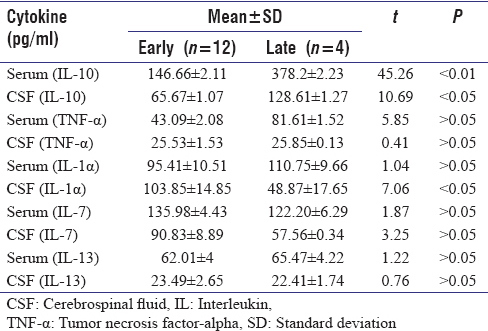 For IL-13, no change was recorded both in the serum and in the CSF (P > 0.05). However, our results should be viewed with caution because of the small sample sizes for individuals at the early (n = 12) and late (n = 4) stages. It is evident that IL-10, TNF-α, IL-α, and IL-7 are interacting in a complex manner with itself and others in boosting immunity of HAT patients. However, prominent among these cytokines is IL-10 being raised in seropositives as well as in serum and CSF of late stage of HAT. We thus suggest that IL-10 should be considered in the staging of HAT as it has proved to be a potential biomarker. We would like to thank all the HAT positive volunteers. World Health Organisation. Control and Surveillance of African Trypanosomiasis. Geneva, Switzerland: World Health Organisation; 1998. Bisser S, Bouteille B, Sarda J, Stanghellini A, Ricard D, Jauberteau MO, et al. Contribution of biochemical tests in the diagnosis of the nervous phase of human African trypanosomiasis. Bull Soc Pathol Exot 1997;90:321-6. Lejon V, Reiber H, Legros D, Djé N, Magnus E, Wouters I, et al. Intrathecal immune response pattern for improved diagnosis of central nervous system involvement in trypanosomiasis. J Infect Dis 2003;187:1475-83. Miezan TW, Meda HA, Doua F, Yapo FB, Baltz T. Assessment of central nervous system involvement in gambiense trypanosomiasis: Value of the cerebro-spinal white cell count. Trop Med Int Health 1998;3:571-5. Dempsey WL, Mansfield JM. Lymphocyte function in experimental African trypanosomiasis. V. Role of antibody and the mononuclear phagocyte system in variant-specific immunity. J Immunol 1983;130:405-11. Kaushik RS, Uzonna JE, Gordon JR, Tabel H. Innate resistance to Trypanosoma congolense infections: Differential production of nitric oxide by macrophages from susceptible BALB/c and resistant C57Bl/6 mice. Exp Parasitol 1999;92:131-43. Sileghem M, Darji A, Hamers R, De Baetselier P. Modulation of IL-1α production and IL-1α release during experimental trypanosome infections. Immunology 1989;68:137-9. Fonseca SG, Reis MM, Coelho V, Nogueira LG, Monteiro SM, Mairena EC, et al. Locally produced survival cytokines IL-15 and IL-7 may be associated to the predominance of CD8+T cells at heart lesions of human chronic chagas disease cardiomyopathy. Scand J Immunol 2007;66:362-71. Bakhiet M, Jansson L, Büscher P, Holmdahl R, Kristensson K, Olsson T. Control of parasitemia and survival during Trypanosoma brucei brucei infection is related to strain-dependent ability to produce IL-4. J Immunol 1996;157:3518-26. Noël W, Hassanzadeh G, Raes G, Namangala B, Daems I, Brys L, et al. Infection stage-dependent modulation of macrophage activation in Trypanosoma congolense-resistant and -susceptible mice. Infect Immun 2002;70:6180-7. Tachado SD, Schofield L. Glycosylphatidylinositol toxin of Trypanosoma brucei regulates IL-α and TNF-α expressions in macrophages by protein tyrosine kinase-mediated signal transduction. Biochem Biophys Res Commun 1994;205:984-91. Rhind SG, Sabiston BH, Shek PN, Buguet A, Muanga G, Stanghellini A, et al. Effect of melarsoprol treatment on circulating IL-10 and TNF-α levels in human African trypanosomiasis. Clin Immunol Immunopathol 1997;83:185-9. Okomo-Assoumou MC, Daulouede S, Lemesre JL, N'Zila-Mouanda A, Vincendeau P. Correlation of high serum levels of tumor necrosis factor-α with disease severity in human African trypanosomiasis. Am J Trop Med Hyg 1995;53:539-43. Weitzmann NM, Cenci S, Ritas L, Brown C, Pacifici RC. Interleukin-7 stimulates osteoclastogenic formation by up-regulating T-cell production of soluble osteoclastogenic cytokines. Immunobiology 2000;96:1873-8. Enanga B, Burchmore RJ, Stewart ML, Barrett MP. Sleeping sickness and the brain. Cell Mol Life Sci 2002;59:845-58.
de Waal Malafyt R, Moore KW. Interleukin-10. In: Thompson AW, editor. The Cytokine Handbook. 3 rd ed. San Diego: Academic Press; 1998. p. 333-64. Uzonna JE, Kaushik RS, Gordon JR, Tabel H. Immunoregulation in experimental murine Trypanosoma congolense infection: Anti-IL-10 antibodies reverse trypanosome-mediated suppression of lymphocyte proliferation in vitro and moderately prolong the lifespan of genetically susceptible BALB/c mice. Parasite Immunol 1998;20:293-302. Schopf LR, Filutowicz H, Bi XJ, Mansfield JM. Interleukin-4-dependent immunoglobulin G1 isotype switch in the presence of a polarized antigen-specific Th1-cell response to the trypanosome variant surface glycoprotein. Infect Immun 1998;66:451-61. MacLean L, Chisi JE, Odiit M, Gibson CW, Ferris KP, Sternberg MJ. Severity of human African trypanosomiasis in East Africa is associated with geographical location, parasite genotype, and host inflammatory cytokine response profile. Infect Immun 2004;72:7040-4. Sternberg JM, Rodgers J, Bradley B, Maclean L, Murray M, Kennedy PG. Meningoencephalitic African trypanosomiasis: Brain IL-10 and IL-6 are associated with protection from neuro-inflammatory pathology. J Neuroimmunol 2005;167:81-9. Lejon V, Lardon J, Kenis G, Pinoges L, Legros D, Bisser S, et al. Interleukin (IL)-6, IL-8 and IL-10 in serum and CSF of Trypanosoma brucei gambiense sleeping sickness patients before and after treatment. Trans R Soc Trop Med Hyg 2002;96:329-33. Guzman J, Frei K, Nadal D. In vitro immunization: Generation of neutralizing monoclonal antibodies to human interleukin-10. J Immunol Methods 1995;179:265-8. Namangala B, Brys L, Magez S, De Baetselier P, Beschin A. Trypanosoma brucei brucei infection impairs MHC class II antigen presentation capacity of macrophages. Parasite Immunol 2000;22:361-70. Daulouède S, Bouteille B, Moynet D, De Baetselier P, Courtois P, Lemesre JL, et al. Human macrophage tumor necrosis factor (TNF)-alpha production induced by Trypanosoma brucei gambiense and the role of TNF-alpha in parasite control. J Infect Dis 2001;183:988-91. Mills CD, Kincaid K, Alt JM, Heilman MJ, Hill AM. M-1/M-2 macrophages and the Th1/Th2 paradigm. J Immunol 2000;164:6166-73.